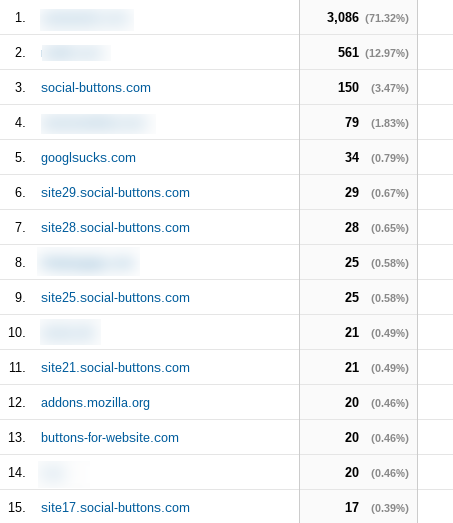 While the majority of our traffic came from genuine sources, we started noticing a pattern in our referral traffic. This is not cool, Mr. social-buttons.com. P**s off! Since we’re using NGINX to serve our site, the solution is going to be described for NGINX. Apache people can take a look at this excellent article. This works, but what if we want to maintain a larger blacklist of referers? Our valid_referers directive would get crazy long. If that’s fine with you, you can stop reading here. It sure isn’t fine with me :). * Both ngx_http_referer_module and ngx_http_map_module are included in the standard NGINX distribution and you don’t need to recompile your server. Blacklist by oohnoitz which blocks bad bots, pentest tools, surveillance bots, etc. It’s an excellent addition to the referer spam blacklist described in this post.